Do you want your website visitors to keep coming back? Fresh new content is the best way to have repeat visitors, and a blog is the best tool to create regular fresh content regularly. Stay on topic, make it relevant to your audience and your business will gain credibility. Solve a problem for your visitor, and you will get loyalty. It is a winning formula and for maximum effectiveness make sure it is search engine optimised, and it is shareable to multiple social media channels. 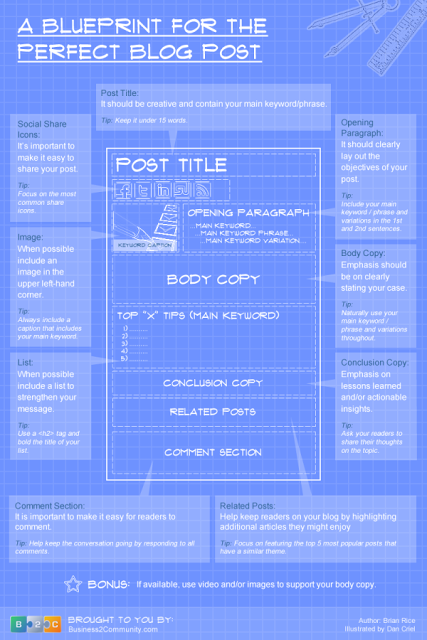 Below is an excellent infographic from Business2Community.com; it depicts the anatomy of a perfect blog post in a way that is easy to follow and emulate. Don't think you are wasting your time if you don't do everything to the letter. Look at this as a guide and do what is possible for you. It should be creative and contain your primary keywords. Tip: Keep it under 15 words. It should clearly lay out the objectives of your post. Tip: include your primary keywords and variations in the 1st and 2nd sentences. Emphasis should be on clearly stating your case. Tip: Naturally use your primary keyword and variations throughout. Emphasis on lessons learned and actionable insights. Tip: Ask your readers to share their thoughts on the topic. It's important to make it easy to share your post. Tip: focus on the most popular share icons. When possible include a picture in the upper left-hand corner. Tip: always include a caption that includes your relevant keywords. When possible include a list to strengthen your message. Tip: use a <h2> tag and bold the title of your list. It is essential to make it easy for readers to comment. Tip: Help keep the conversation going by responding to all comments. Help keep readers on your blog by highlighting additional; articles they might enjoy. Tip: Focus on featuring the five most popular posts that have a similar theme.